The Gadget: Sony Ericsson's K850i is part of Sony's CyberShot line of phones which boast high quality cameras in a cellphone package. In addition to its 5 MP camera and unusual design, the phone has three touch sensitive buttons just below the screen. Is this powerful enough to throw your point and shoot aside? The Verdict: The dedicated camera buttons (on/off, shutter, zoom, photo/video/playback) on the side go a long way toward making this feel like a real point and shoot. It takes good photos in average daylight situations and has a powerful flash. It comes with a standard array of modes (macro, sports, twilight, etc...), and specialized features like BestPic, which takes 9 "burst" photos and lets you pick the best one. The four digit keys on the right side also become dedicated buttons in camera mode, with blue icons that glow while active. Photos are good in daylight and the flash is powerful. Videos are smooth, but show visible signs of compression. As a camera, the interface its a step toward feeling like an actual camera, but it's still not there. 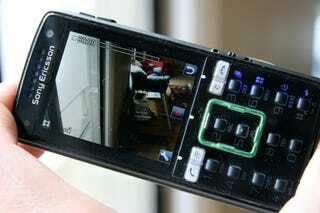 It's extremely awkward to hold the phone in camera mode and and use any of the buttons on the backside of the phone. It's just not ready to replace a point and shoot. Which makes it's size (almost an inch thick), somewhat inexcusable. Sony Ericsson's UI is as polished as a non-smartphone interface comes. Everything on the screen is laid out clearly, menus are intuitive, icons are bright and colorful. I'm not a huge fan of the keypad cosmetically, but it does look nice when it glows. My main gripe is the keypad has too many buttons crammed around the screen. A green four-way navigation ring wraps around two buttons, neither of which are used as a select button. (Both are hot keys; one for web, one for messaging.) The selection and context functions are passed on to the touch-sensitive keys, which are a nightmare to use. I have to press the touch keys repeatedly and in different ways to get them to work. The silver hard keys are placed too close to the touch-sensitive keys, which led me to hit wrong keys repeatedly. While there are a lot of good things this phone offers, none of them outweigh the bad found in the essential features.